In 2015/16 Wayne G Madden worked for Community Hubs Network as the SLAP Film Club Coordinator. This information and video, taken from the official SLAP website, shows an example of the Coordination work that Wayne has done professionally. Also included is the original news report from ‘Made in Tyne and Wear’ that Wayne organised on his first week in the job! The SLAP! 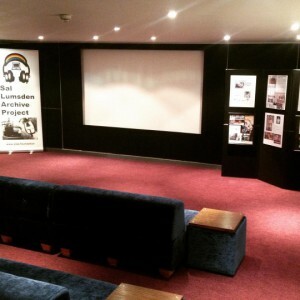 Film Club has worked alongside the main Archive Project since its inception, providing informative and educational content on screen, while also giving SLAP! a platform through which to head-hunt amateur historians and obtain those all-important connections that will make the project succeed. We also sat down recently with Film Club Coordinator Wayne Madden to talk about this and discuss what actually goes into making the Film Club run smoothly. Wayne, thanks for speaking to us. So, Film Club Coordinator for the Sal Lumsden Archive Project. It’s quite a mouthful, but what does it entail? The Sal Lumsden Archive Project, or SLAP!, is an LGBT archive project looking to build a website promoting history, heritage and reminiscence for the North East of England. The Film Club is a separately funded, but equally important, wing of the project that works alongside SLAP! to provide an area of safety for vulnerable and older members of the LGBT community, as well a promotional platform through which to discuss the work of SLAP! and appeal for items of historical interest. The Film Club is open to all ages and is non-discriminatory, but its focus was on attracting those people who might not feel a nightclub or a bar or an office would be the most ideal location to share stories and reminisce on the past. In a nutshell, I organise Film Club nights at various venues across the North East region and encourage people to attend. I also choose the catalogue of films that we show and I make connections with the proprietors of these venues and organisations to further good relationships between themselves and SLAP!. You mention history a lot, so I take it the Film Club is all about historical films? To a certain extent, yes, that’s true. The Film Club selections I’ve made have been films of note in the LGBT genre, or focus on older members of the LGBT community, or have a certain historical context about them. For example, in the case of the 2014 British film Pride, you’re talking about a film based around the Miner’s Strike of 84/85 and the story of the foundation of LGSM (Lesbians and Gays Support the Miners). Did choosing the films present any difficulty? Yes, it did; it was certainly a responsibility I didn’t take lightly. On the one hand, I was aware that no matter the film in question, there were always going to be arguments for and against. But on the other hand, I was also well aware that I had a responsibility to choose a wide range of films from a broad spectrum that appealed to as many people as possible, while at the same time focusing on films which didn’t seek to undermine or preach particular issues. It was also trying to get a balance between films that were happy and sad. A lot of films in the LGBT community are depressing films because they show hard facts about real stories which didn’t end well, Boys Don’t Cry being a perfect example. In the case of this film, I knew that it had to be included because it was a mainstream and highly publicised movie dealing with transgender issues. But I also knew that it didn’t have a happy ending and motivating people to come and watch a film that isn’t going to make them feel good at the end can be a hard thing to do. Were you surprised by some of your own selections, or have you received any feedback from those you’ve engaged with questioning specific choices? I have actually received quite a lot of feedback, which is very reassuring, because even if nobody attends any of the films, I think there is a great talking point created. Social media being what it is, myself and our web developer, Scott, send out a few tweets and Facebook messages and get the conversations going a few weeks in advance, attempting to drum up publicity for each screening. This gets people tweeting about the film and even if they’re hundreds of miles away, in the US or whatever, they’re thinking about the film and the issues it raises and they’re helping to promote our cause by giving feedback on the issue and spreading our message around. There are a few films, like Notes On A Scandal which I received criticism about because people don’t consider it an LGBT film. And I agree, but I think it raises a lot of LGBT issues and the depiction of the character is done in such a way that it makes it essential viewing. I also felt that Nightmare On Elm Street 2 might raise a few eyebrows and this film received inclusion because there has been a number of interviews done with the writer of the script in the very recent past, following on from a documentary about the series in 2010, in which he reaffirmed comments he’d made in 2007 that the film was written as a gay allegory. It was almost a subtle attack against the conventions of Hollywood and LA at the time when the lead actor (himself a gay man) was expected to conform by his agent if he ever hoped to find work. I also received criticism about Philadelphia because although it was an important film at the time it was released, and tackled AIDS in a way no other mainstream film had done before, it is now viewed as being dated and a product of the times. But from a historical perspective, I believed this was an extremely important film that needed to be included. So how does an event happen, on the night, can you take us through it? Sure. I mean a lot of the work is done beforehand, in contacting a venue, negotiating everything from a time to a price to any extra arrangements needed and finalising my arrival time on the day. In some cases, I arrived and helped Alan (our Exhibitions Manager) set up a mini exhibition piece we have on LGBT history and SLAP!, and in other cases, I just arrived and checked the equipment to make sure everything was working. Sometimes I had to go the day before to check that everything was set up and plugged in and other times I just turned up and the venue had people who’d already done that. Once the lights were adjusted and the room is prepped, my job was to welcome guests, greet them and talk to them, invite them to check out the exhibition and just really keep the atmosphere up. Some venues called for a short introduction by myself and I talked about the history of the film and what not, give out a few facts people may or may not know. Then we screened the film. Afterwards, there was time to mingle, then I helped dismantle whatever needed it and left. Do you have any specific rituals before the screening? Other than those discussed, not really, although I do tend to use a separate film when testing the equipment. Checking the need for subtitles, the colour variants, if the lens of the projector is in focus and how high the audio can go, that kind of thing, mainly because if someone arrives early I don’t want to spoil the atmosphere of a crucial scene or something in the main film. As a kind of joke, I normally bring a copy of Highlander 2 in order to test the film with. I do this because, while it has no relation whatsoever to LGBT film, it is universally condemned as one of the worst films ever made. I don’t mind it so much. But whatever, people seem to hate this film, and it has become known for that and I find it amusing to see Highlander 2 shown (unofficially) on all these projection screens and locations across the North East. I’ve also aired Star Trek: The Animated Series before screenings for similar reasons. What kind of films do you watch yourself? I love everything, but I think I have a soft spot for really bad movies, things like Superman IV or Robocop 3 or Highlander 2, films which (when you mention them) people go “they made a fourth Superman, with Christopher Reeve, no way? !” because these films just shouldn’t have been made. Ever. But they have a cult following to them because the production is so bad or the script is laughable and it makes people (especially amateur film makers) think “if they can get commissioned for that, they can get commissioned for anything”… I think another film which falls in that category is Star Trek V because William Shatner directed it. Wayne thanks for your time, oh, and how do we find about any upcoming screenings? No problem! You can check the website’s Film Club Event page HERE for all listings and information on remaining screenings. Wayne was talking to Project Manager Richard Neville.